It is obvious to me that CRM 2011 was designed to help users get to relevant data quickly. Features like Recently Visited Records, Navigating Grid Records from within Forms, the ability to quickly create Custom Views and Pin those Views are a few of the methods that ensure meaningful data is only a click or two away. 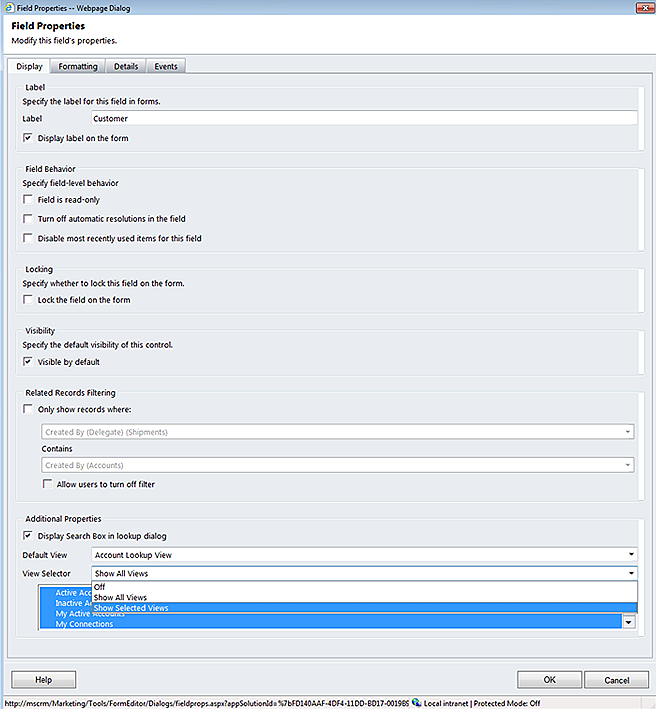 Another feature that is new to CRM 2011 is filtered views as they relate to lookup fields. System Administrators & Customizers can leverage this feature to ensure that a lookup field on an entity is configured to effectively target applicable data when end users select the lookup icon. Here’s an example for reference. In this example, I have a custom entity named Event. 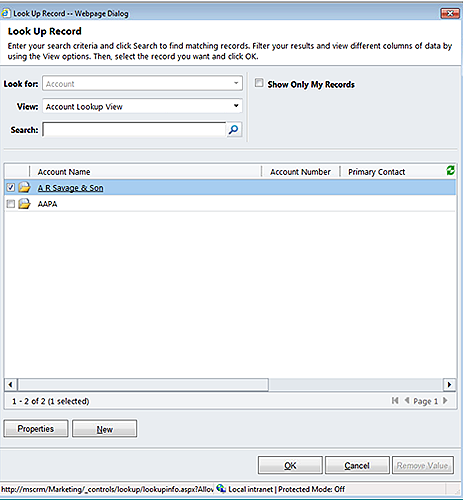 The Event entity has a lookup field to the Account. 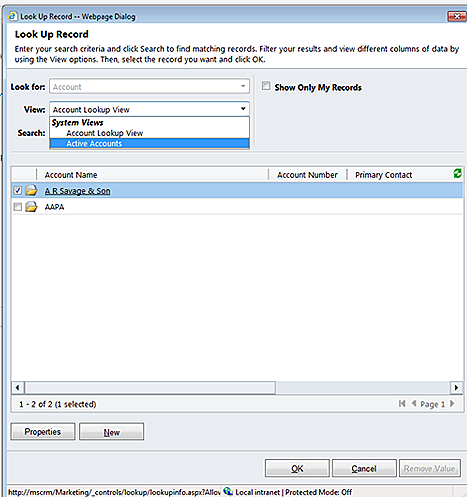 The lookup field is labeled Customer. When I select the field properties of the Customer lookup field, I see that the Show All Views is selected by default. Although having all the Views as options to select provides the highest degree of flexibility for the User, it can also be a bit overwhelming for some and may not be the best option. 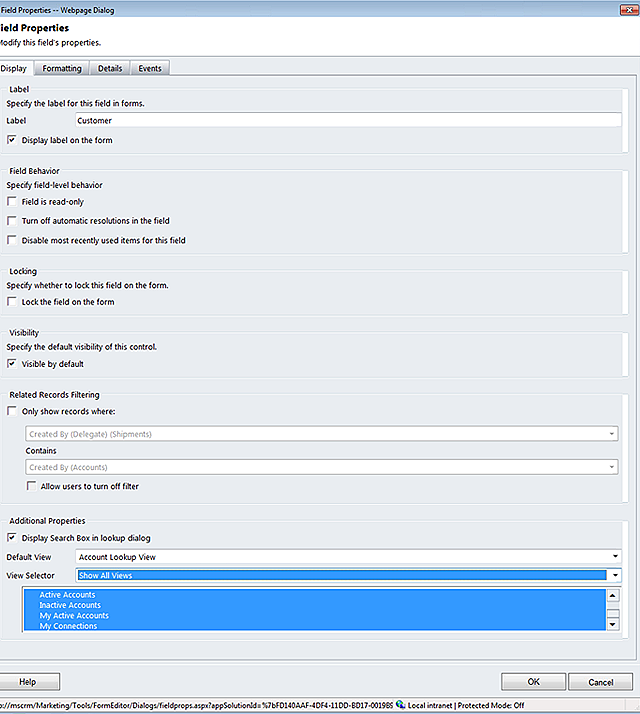 The good news is that CRM provides us the flexibility to configure this setting. Once you’ve made that selection, you can then select the Views you want to display In this scenario, I selected the Active Account view which equates to Active Customer for this CRM Organization. Once you’ve completed your selection, save your changes and publish. It is that easy and fast. Now let’s take a look at what the user sees when he or she accesses the Customer Lookup field from the Event form. In this screenshot, I’ve selected the Customer lookup icon from an Active Event record and you can see that I am presented with the Active Account view. When selecting the View drop down, you can see that the two View options I selected when configuring the field are available. Having fewer and targeted views to select from improves productivity on several levels. It’s easy to understand the potential productivity gain when you consider the number of entities that contain a lookup field, the average number of lookup fields on an entity form, the number of users accessing CRM, and the number of times per day the lookup field is selected. Consider the above variables with an average time-saving of 5 – 10 seconds per lookup field accessed. Depending on the number of users you have in the system, the time savings to get to relevant data can quickly add up. Better yet, you will increase user satisfaction which in turn increases User Adoption which results in better data in and better data out. I encourage you to explore the option of implementing this relatively quick change when configuring lookup fields as it has the potential to pack a nice productivity punch. It is a win for all. Hi – thanks for shating this. I tried to pin my personal view to field “Customer” in pre-built entity “Case”, but I can’t find additional properties when open this field editor. The last field that I see when I open field editor dialogue is “Visibility” and I can turn it on/off. I don’t have listed “additional propreties” for this entitiy. 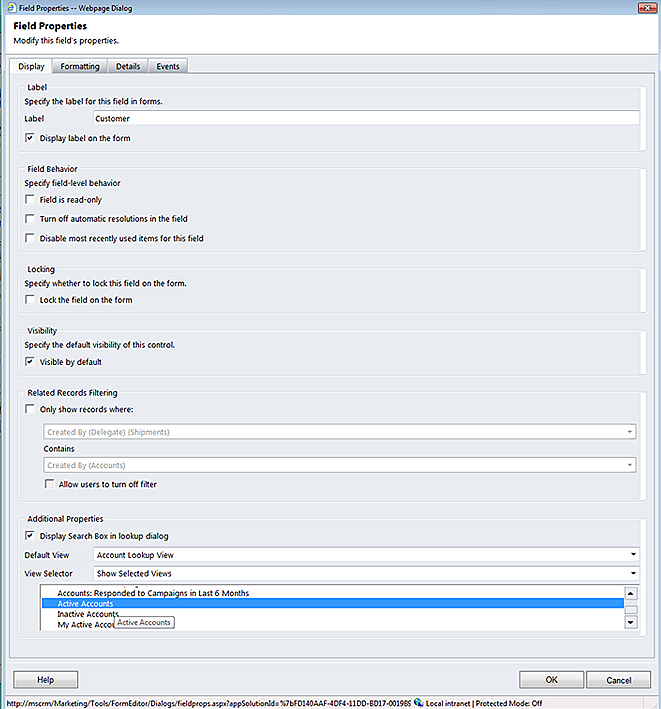 Do you know how to enable additional properties? I’m using CRMOL trial to test it. I’m not sure I completely understand but I’ll attempt to assist. Try creating a System View and that is identical to your personal view, publish your changes and select that System View for the lookup field using the steps in this article. This is a very old post. If you are on CRM 2011, I encourage your company to upgrade.